The December meeting, led by Bob Torbet, was the Annual Christmas Party at the Lima Elks with 18 members and friends in attendance. Bob thanked everyone for coming and gave out a few door prizes. In Jamboree news, Jim let everyone know that the host hotel for the Tiffin based tour will be the Holiday Inn Express. The Hampton did not want to block a big enough section of their hotel to make it worth our while to use them; although, it will be one of the overflow hotels. We continue to discuss some of the places that we would like to go. From a business standpoint, we now have the state ID number to open a special account for the Jamboree. Sue Cook will be the business contact for the Jamboree, with the account now open in one of the Tiffin banks. The closing breakfast on Sunday morning before the tour, which worked out well for last year's tour, is set to go. In the next couple of months we will be looking for volunteers to work on coffee breaks, sponsor donations, and registration help. 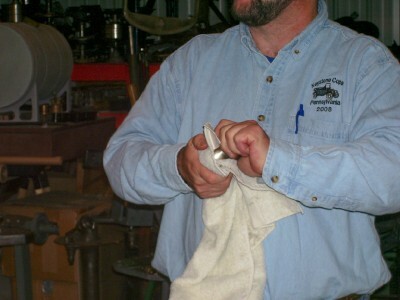 Dave Nolting was kind enough to give us a nickel plating demonstration at the November meeting. Dave is able to get some small amounts of plating supplies through the school system by classifying the use as educational in nature. 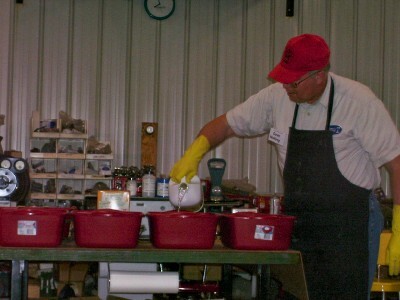 The first tub on the right next to Dave will be used to thoroughly clean the part to be nickel plated. 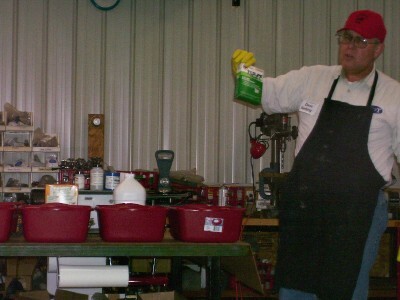 Dave buys a special cleaning agent made for cleaning metals. 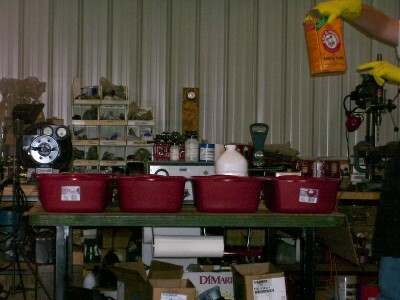 The second tub from the right is filled with muriatic acid. This acid will clear out your nose in nothing flat. It is best to stand off to the side and avoid inhaling the fumes. The acid is used to further clean the part, so that the plating will have something to hold onto in the plating solution. Extreme care must be used to avoid spills or accidental contact with the skin or eyes. This tub removed soon after the demonstration. Here we see Dave holding up a box of ordinary baking soda. The baking soda solution will be in the tube that is second from the left. 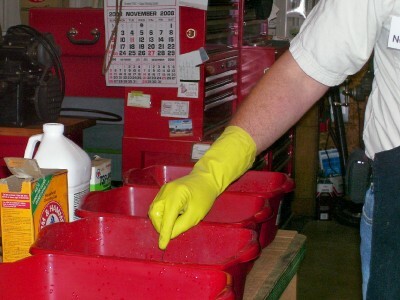 It is used to neutralize the muriatic acid drenched part that will come out of the second tub from the right. You know that all of the acid is washed off of the part when there are no more bubbles forming on the outside of the part. Dave had a couple of different sizes of nickel nuggets that are used in the final stage of the process. The nuggets are attached to either the anode of cathode (I can't remember which). 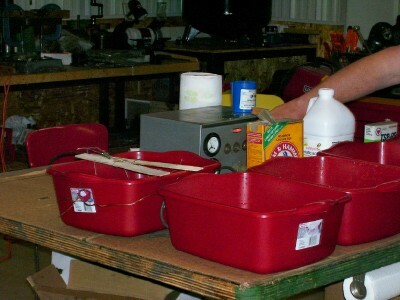 I just remember that the solution in the last tub to the back of the table is nickel sulfate. It is the medium by which the nickel molecules leave the nuggets, migrate through the solution, and attach themselves to the item to be plated. 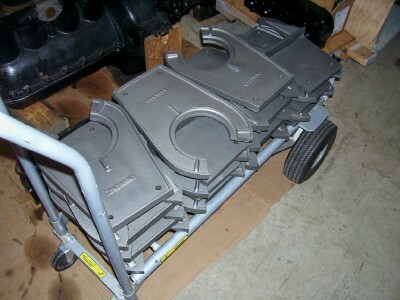 As with all painting or plating operations, the prep work on the part will greatly affect the end result. Bob Torbet had worked on this cap to get most of the scratches out of it. It originally looked like someone had used a pipe wrench to remove it from an old corroded radiator. There were still a few "character" marks on it; but, overall it looked like a good starting point. 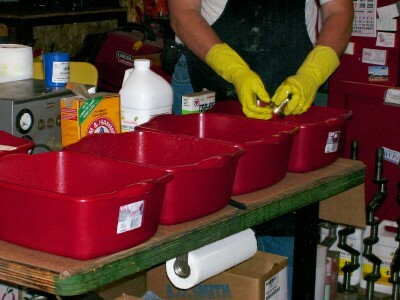 Once all of the chemicals are in place and the part is prepped for plating, the process of cleaning, etching, neutralizing, and rinsing takes place. 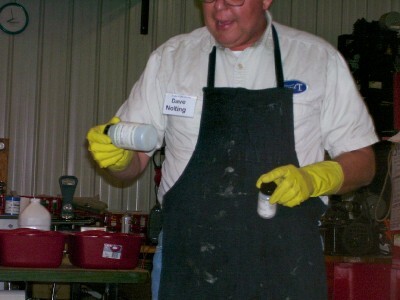 Here we see Dave dipping a radiator cap into the baking soda solution after he had dipped it in the muriatic acid. The next tub will be the distilled water. The water is used to clean off any leftover baking soda. 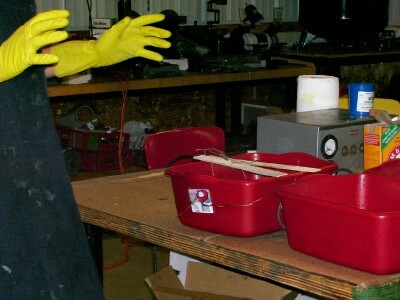 The final tub will be the plating tub that is filled with nickel sulfate. This is where the attached wires come into play. The wire is further attached to a wooden stick that is suspended over the solution. Dave takes care to keep the part off of the bottom of the tub and still under the surface of the solution. 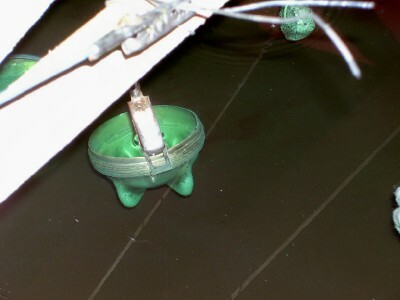 The wire that runs around the outside of the tub is attached to four pieces of nickel nugget that are hanging around the edge of the solution. All of the wires are attached to a power source with alligator clips. Dave used a generic power supply to supply the twelve volts DC needed to force the nickel molecules to make their moves in the solution. A battery can be used as well for this phase of the process. Dave explained that, while time and voltage are both factors, the cleaning seems to be the determining factor in obtaining the best results. This is where the miracle occurs. As DC current is applied to the bath, the nickel pieces that are attached to the one terminal give off nickel molecules that travel through the nickel sulfate and are attracted to the piece of brass or copper that is to be plated. This miracle happens in every plating process, be it gold, nickel, or chrome. It is just normally done on a bigger scale with a lot of OSHA regulations. 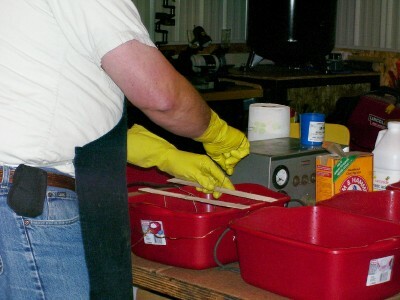 As mentioned earlier, Dave is able to do this demonstration because it is considered a teaching level of raw materials. The magnitude of raw materials that are needed and the volume of toxic fumes in a commercial operation is why there are so many regulations on the plating industry. 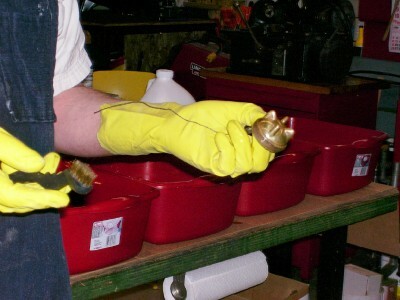 Here we see a radiator cap in the nickel sulfate tub as the plating is happening. It didn't take more than 10 minutes. 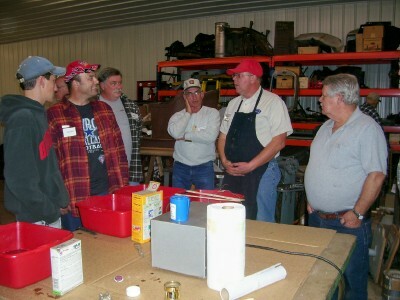 After the nickel plating demonstration, the group was invited up to look over the setup and ask questions. Dave went on to talk about other parts that he had plated in the past. While this night's plating did not go as well as some previous projects, we did get some satisfactory parts out of the process. A radiator nick and a couple of radiator caps are ready for us on the next project. While Dave is answering questions, I go about the job of polishing the pieces to a dull shine. This is where we find out just how well the parts were plated. Any spot that was not thoroughly cleaned will show up at this point. If a spot is found, the part is re-cleaned and the process repeated. I'd like to thank Dave for his willingness to bring all of the supplies to the meeting to perform this nickel plating demonstration. Jack has been working on duplicating the original KR Wilson fixture for rebuilding the rear end of the Model T. This plate attaches to any bench and the center housing fits right into that hole in the middle. It really does make the rebuilding job go a lot faster when you have the proper tools for the job. It is great to see the amount of expertise in the club and be able to glean the knowledge of the group.